"From the crest of the hill we can see the many gleaming frozen mountains of Spitsbergen soaring upwards. Whatever we feel it is not loneliness as we stare into the distance. It is as though we are enclosed in a miraculous world". It has been 2 years in the planning, but now, on International Women's Day I can finally reveal my plans to lead an all female expedition to honor my female Polar hero, Christiane Ritter, who wrote the above sentiment. In May myself and 2 female friends will undertake a 3 week ski and camping expedition to honour our Polar hero, Christiane Ritter. In 1934, Christiane became the first recorded woman in the world to spend a year, including a brutal winter, living so far north in the world, in Svalbard. The expedition was inspired by Christiane’s beautifully observed book, "A Woman in the Polar Night". Christiane was woefully naive and unprepared for life in the extreme Arctic environment when she joined her trapper husband in the summer of 1934. All those around her told her not to go, that it wasn't a place for women and that she would perish. They even refused to let her off the ship in Svalbard because she was a woman, but she insisted. 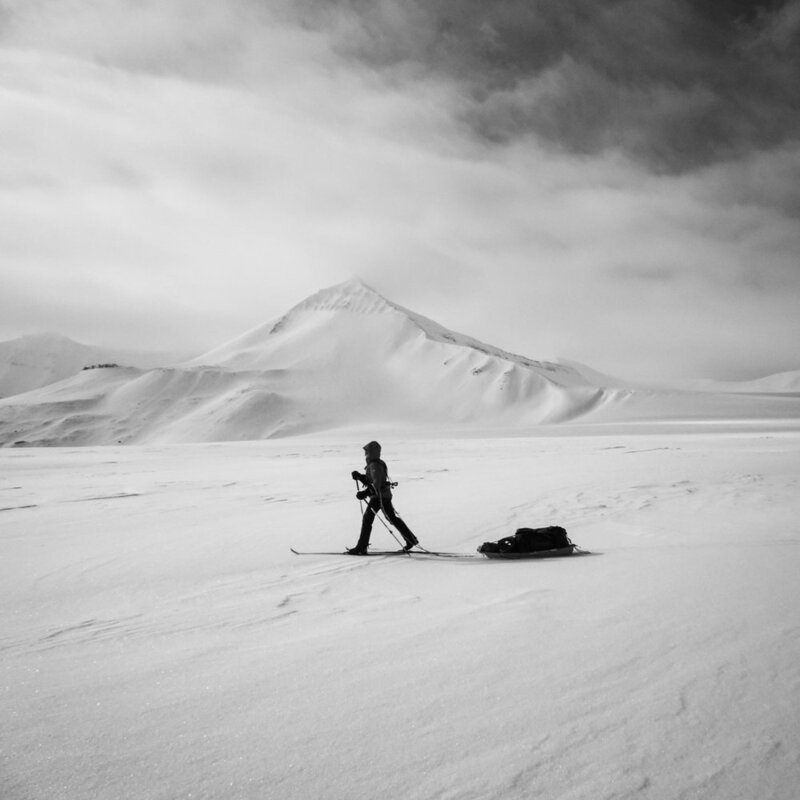 She found the conditions hard, including the total isolation of living in one of the most remote places on the planet, months of complete darkness during the polar winter, extreme weather and temperatures of minus 40, all whilst living in a wooden 2m squared cabin with little food, comforts and very few resources. Instead of suffering or going mad like many others did, she chose instead to embrace the challenges and beauty of the Arctic, and whilst writing her book dedicated to Svalbard she not only survived, but thrived. We will start and finish our expedition in the Soviet ghost town of Pyramiden, skiing nearly 300km whilst pulling sleds that weigh more that our own body weight. Our destination - Christiane's derelict cabin on the tip of Grey Hook, just south of the 80th parallel. Through our journey we will tell Christiane's story through photos and extracts of poetry from Christiane’s book, alongside the team’s own adventure 84 years on. Their journey will take us up mountains, down glaciers, across frozen fjords and through one of the world’s toughest environments. We will endure camping in temperatures of minus 30 and below, the risk of polar bear attack and skiing 25km per day. Svalbard is arguably the most spectacular place on earth with jaw dropping scenery and rare wildlife, including seals and walrus out on the ice, as well as reindeer and Arctic sea birds. The team would like to use this journey to promote female exploration and their achievements in the Arctic in the historic year that marks the 100th anniversary of the suffragette movement. We want people who follow our adventure to know that women, like the famous men, also had extraordinary adventures in the Arctic. Sadly, these women aren't known of and history only remembers the men. She may not have been first to the poles or discovered new lands, but what Christiane did was remarkable for a woman of her time, a time when women didn't have the rights, opportunities and freedoms that we have today. The team want to demonstrate to other women what can be achieved with a positive mindset. This is a gripping, heartening story of a woman's survival, highlighting how a determined attitude and outlook can overcome the hardest of circumstances. It’s my last day in New York. As always, for some reason this crazy noisy fun city always asks me big questions, and I don’t always have the answers. Perhaps it’s the timing of my visit? The people I meet? The fact all my fiends have now gone home? Maybe it’s the overwhelming scale and business of the place or the fact that everybody here is doing something extraordinary with their lives that’s so inspiring. It does something that makes me take a step back and consider what I’m doing. That’s a good thing, but it can be unnerving. I’m weighing up a few things in my life right now and asking myself this big question about all the questions I’m asking myself certainly helps. What I’m stressing about, who I’m thinking of, what I’m committing to, how I’m spending my precious time, will it still matter in 10 years time? If not, I’m binning it.